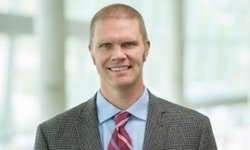 UNMC › Pathology and Microbiology › Faculty › Bios › Scott Koepsell, M.D., Ph.D.
Quist E, Koepsell SA. “Autoimmune Hemolytic Anemia and Red Blood Cell Autoantibodies.” Arch Pathol Lab Med. In press. Koepsell SA, Grant W, Landmark JD. “Autoantibodies to red blood cell antigens occur frequently with hemolysis among small bowel transplant recipients: Clinical implications and management.” Pediatr Transplant. In press. Koepsell SA, Burright-Hittner KB, Landmark JD. “Evans’ syndrome in a pediatric liver transplant recipient with an autoantibody with specificity for the KEL4(Kpb) antigen.” Immunohematology. 2014;30(1):14-7. Koepsell SA, Le M, Lassig AA, Lindgren B, Cohn C, Khariwala SS. “Transfusion of aged blood in head and neck free flap surgery: perioperative outcome analysis.” J Otol Rhinol. 2013 Dec; 3:1. Koepsell SA, Landmark JD. “Passenger lymphocyte syndrome: use of archived donor organ biopsy obtained at the time of transplantation for diagnosis.” Am J Trans. 2013 Aug; 13(8): 2227. Koepsell SA, Miller JS, McKenna Jr DH. “Natural killer cells: a review of manufacturing and clinical utility.” Transfusion. 2013 Feb; 53(2): 404-10. Koepsell SA, Kadidlo DM, Fautsch S, McCullough J, Klingemann H, Wagner JE, Miller JS, McKenna Jr DH. “Successful "in-flight" activation of natural killer cells during long-distance shipping.” Transfusion. 2013 Feb; 53(2): 398-403. Koepsell SA, Hinrichs SH, Iwen P. “Applying a Real-Time PCR Assay for Histoplasma capsulatum to Clinically-Relevant Formalin-Fixed Paraffin-Embedded Human Tissue.” J Clin Micro. 2012 Oct; 50(10):3395-7. Koepsell SA, Anderson DR, Radio SJ. “Parvovirus B19 is a bystander in adult myocarditis.” Cardiovascular Pathology. 2012 Nov; 21(6): 476-81. Zantek N, Koepsell SA, Tharp D and Cohn C. “The Direct Antiglobulin Test (DAT): A Critical Step in the Evaluation of Hemolysis.” Am J Hematol. 2012 Jul;87(7):707-9. SA Koepsell, GA Talmon. “Light Microscopic Diagnosis of Microvillus Inclusion Disease on Colorectal Specimens Using CD10.” Am J Surg Path. 2010 July; 34(7): 970-972. SA Koepsell, AG Freifeld, AR Sambol, RD McComb and SA Kazmi. “Seronegative Naturally-Acquired West Nile Virus Encephalitis in a Renal and Pancreas Transplant Recipient.” Transplant Infectious Disease. 2010 Oct; 12(5): 459-64. SA Koepsell, MA Larson, CA Frey, SH Hinrichs and MA Griep. “Staphylococcus aureus primase has higher initiation specificity, interacts with single-stranded DNA stronger, but is less stimulated by its helicase than Escherichia coli primase.” Mol Microbiol. 2008 June; 68(6): 1570-82. MA Griep, S Blood, MA Larson, SA Koepsell and SH Hinrichs. “Myricetin inhibits Escherichia coli DnaB helicase but not primase.” Bioorg Med Chem. 2007 Nov 15;15(22):7203-8. SA Koepsell, MA Larson, MA Griep and SH Hinrichs. “Staphylococcus aureus helicase but not Escherichia coli helicase stimulates S. aureus primase activity and maintains initiation specificity.” J Bacteriol. 2006 Jul;188(13):4673-80.